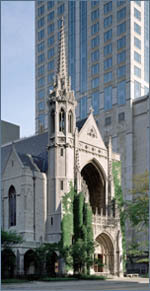 The Fourth Presbyterian Church of Chicago was organized on February 12, 1871, through the merger of two older congregations, North Presbyterian Church (founded in 1848) and Westminster Presbyterian Church (founded in 1855 as a mission church of the First Presbyterian Church of Chicago). 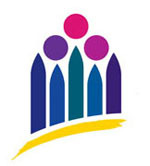 The name “Fourth” was selected not because it was the fourth Presbyterian church to be founded in Chicago—there had been several founded before then, with North Presbyterian being one of the earliest—but because “Fourth” was the lowest number then not in use. The newly organized congregation spent six months refurbishing its intended home, North Presbyterian’s existing church building (on the southeast corner of Wabash and Grand, near where Nordstrom’s department store is now), and rededicated the renovated structure on Sunday, October 8, 1871. Unfortunately, only a few hours after the evening services concluded that Sunday, the Great Chicago Fire swept through the downtown and Near North Side, and the church building was destroyed (see the timeline on the Fourth Church page on Facebook for photos). The congregation wasted little time rebuilding and in February 1874 dedicated a stone church on the northwest corner of Rush and Superior Streets, a worship space that would serve Fourth Church well for just over forty years. But with a new pastor, John Timothy Stone, arriving in 1909, the continued growth of the congregation and its programs, and increasing development of Chicago’s Near North Side, in 1911 Fourth Church decided it had outgrown its property at Rush and Superior. They purchased a plot of land three blocks north, on what would later become Michigan Avenue, and the cornerstone for a new edifice was laid on September 17, 1912. There was no “Michigan Avenue” north of the Chicago River yet in 1912; it was to be several years before a bridge was constructed over the Chicago River to extend north the Michigan Avenue that had grown in prominence south of the river. In the early twentieth century, the road north of the river was called “Pine Street,” and as it worked its way north from the river it wasn’t nearly as prominent as the street one block west, Rush Street, where numerous scions of capital and industry had built their lavish mansions in the late 1800s. Around the Old Water Tower, Pine Street jogged slightly and became “Lincoln Parkway,” as it carried carriages—and increasingly, automobiles—north toward Lincoln Park, past a row of newer mansions along what is now Lake Shore Drive. It was on this “Lincoln Parkway” that the congregation built its new facility, filling the block between Delaware Place and Chestnut Street. The church proper (the Sanctuary) was designed by architect Ralph Adams Cram, the parish buildings around the courtyard by architect Howard Van Doren Shaw, and the stained glass windows by Charles J. Connick. The interior painting and decoration of the Sanctuary was overseen by Frederick Clay Bartlett. The new church was dedicated in 1914, just in time to welcome that year’s General Assembly, the annual meeting of the Presbyterian Church, of which Pastor Stone was the outgoing moderator. The North Michigan Avenue “Magnificent Mile” neighborhood literally grew up around the church, particularly after the opening of the Michigan Avenue Bridge in 1920. Except for the familiar Water Tower complex two blocks to the south, which survived the Chicago Fire of 1871, Fourth Church is now the oldest surviving structure on Michigan Avenue north of the river.